Danny’s Yellow Porsche Leads the field early in race 1. 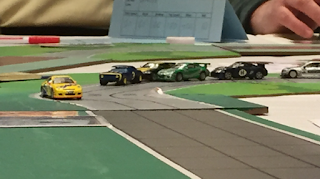 Notice the restored Camaro in second place. I also picked up two new cars, a late 60’s Camaro and what appeared to be an AMC GTX. They were in really bad shape when I got them (at a hefty price for what they were) and while I’m not a painter, they looked decent on the track after I fixed them up some. I’m always on the lookout for 1/87 scale cars, as they are not easy to find at a decent price. Dave Ingraham picked up 5th followed by Don, John, and Mike Lind. Mike had a piece of wisdom to share after his first race, “Maybe next time I won’t spend all my wear on the first lap.” Final results. Track from race 4. Bridge! Don Tatum – Winner, new Prezcon Champion, and receiver of the plaque. ... would have been Chris Long... perhaps the best what-if-champion ever. 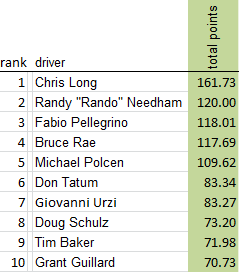 In last week's Organized Play rankings update I mentioned that I had pretty good data going back to 2013  for Championship Formula Racing results. What I mean by pretty good data is more than one source. Prior to 2013 close to all of my data comes from the World Boardgaming Championship tournament (and its predecessors). From 2013 on, I had at least 2 major tournaments and sometimes some one-off races to draw from. Below are some stats from those seasons including what I've logged so far in this season. A race opportunity is the number of total races you could enter that season if you entered everything. 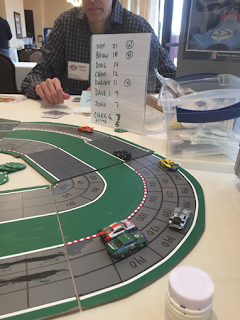 Because most tournaments end up running multiple simultaneous heats in order to accommodate large numbers of drivers, the number of actual races run is always a good bit larger than the number of race opportunities. This historical data was good to have. It gave me some reality checks when fine-tuning the rankings process and the 2016 data is used this year to help weight the competition in each race. It also means that I can go back and run the rankings for each of those years. These years aren't official Organized Play seasons and none of the what-if-champions from 2013-2016 will get any prize. But, just for fun, what would have happened if Championship Formula Racing Organized Play had existed in 2016? Spoiler alert... Chris Long won and racked up the most points by far of any previous what-if-champion. A quick note about this season... because the results of a tournament and its races do not count until the tournament is over and it took me a long time to finish my F* PBeM, many of those races actually started in the 2015 season but counted in the 2016 season. Chris won two races that season but also had two second place finishes that counted for more than many wins do based on the competition. His best race was a win in the top tier of the F* PBeM which had a field rating of 1.55. He placed second in another race in that series. He also won a qualifying heat at WBC that year and placed second in a top tier race in the Redscape PBeM. Chris' main competition in 2016 came from Randy Needham and Fabio Pellegrino. Both won 3 races to Chris' 2 but while their top-2 races scored them more points Chris' 3rd and 4th best races closed the gap for him leaving him with a slight edge in points from his top-4 races that season. Chris really pulled away in the rankings due to his tournament results. Chris not only won F*, he finished 3rd in Redscape's tournament that season. Combined he received 52.54 points from those two tournaments -- more than double anyone else in 2016. Bruce Rae was Chris' closest competition based on tournament results after winning WBC that year. But Bruce labored in lower tiers of F* that season and ended up 15th. Michael Polcen won the Redscape tournament but finished 19th in F* and 26th at WBC. One of the reasons that Chris' total score of 161.73 was so much higher than previous what-if-champions is because the 2016 what-if-season was the largest to that point in every metric except total numbers of tournaments. But Chris drove the hell out of that season and gaped a great field of competitors. [ 1 ] I name seasons based on the year they end. So the current 2017 season started Septemberish 2016 but will end after WBC 2017. Michael opens his new copy of this game and we discuss our impressions from our previous and only game play to that point. We show off our lack of knowledge about the game and I show off my bad camera skills. We've played the game again since. I still like it and still feel like I don't know how to play it well. Or maybe I just need to stop trying to play with Yellow Sign. Many thanks to Steve Schillinger and Braddock Station Garrison for allow us to use their music. Check them out. A couple of weeks ago I announced CFR's organized play series. What I did not mention at the time is that the premiere season of CFR OP is already underway. The 2017 season will end with this summer's World Boardgaming Championships at the end of July. Which means we are already months into that season. So far 64 different drivers have participated in 19 different races. Although many of those races occurred simultaneously so there have been 7 unique race opportunities so far this season. 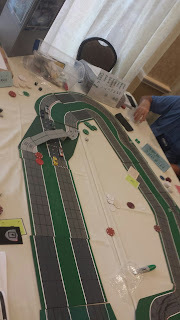 Most of the races so far stem from the 3 rounds of my play by mail which ended in January. 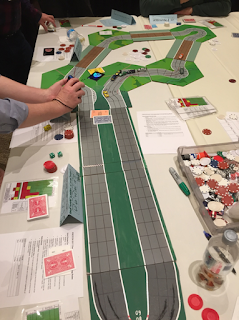 There have also been 4, one-off races held this year: 2 PBeMs run under Redscape's banner and two run by me at small conventions in the Washington, DC area. Enough talk. The PDF of the complete rankings this season so far and the current top-5 below. Before we talk about how Doug G is leading the 2017 season so far, I'll explain what each column means. Next to the rank is an indication of the change from last seasons rank (yes, I know what each driver's rank would have been last season, I'll talk more about the past in another post). Total points is how each driver is ranked and is the sum of the top 4 adjusted races and top 2 adjusted tourneys. Top 4 adjusted races is the sum of their top 4 race scores, adjusted for competition. In fact, the next 4 columns enumerate those 4 races. Top 2 adjusted tourneys is the sum of their top 2 tournament scores adjusted for competition. Like races, those two scores are listed in the next 2 columns. The last 4 fields do not directly count towards the total points but provide some context on the season: races run, races won, avg field rating of races participated in, tournaments participated in, and tournaments won. If you want to know more about where these numbers come from, I've documented the methodology. Now lets break down Doug's lead. So far this season, Doug has participated in only 3 races -- all in my PBeM. But he won 2 races at the highest level of that PBeM, against stiff competition, and won that tournament. If you look at Doug's average field rating, you'll see that the competition in those 3 races was 50% tougher then the average race and that is why his 2 race wins garnered him 35 points each -- compare to my 2 race wins which were against more average competition and so generated me 23 and 20 points. Another big key to Doug's top ranking are the points he got for winning my PBeM. Otherwise, Gio might be the current top driver as Gio has more points from his top 4 races right now. Stay tuned, I'll update these rankings after every major event. Two weeks from today one of the oldest Championship Formula Racing tournaments gets started in Charlottesville, VA at the PrezCon Winter Nationals. Chris Brandt has run that event for a long time and does a great job with it. He brings a fully modular set-up for building tracks so you end up with a different track every time and you have little idea what you will be racing on before you sit down to race. 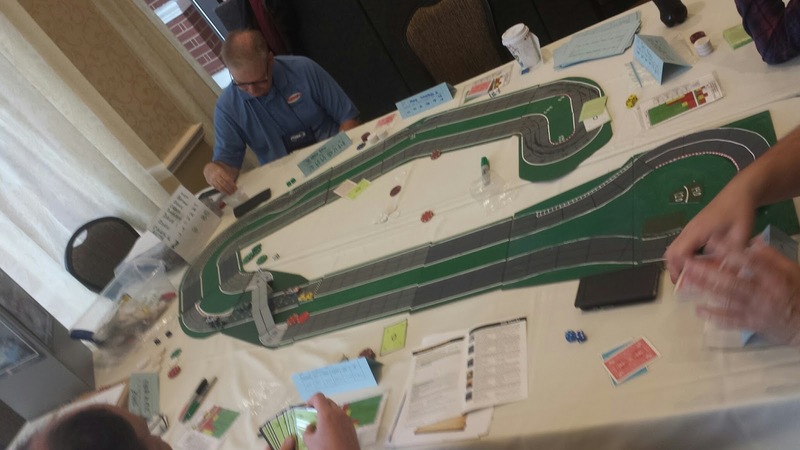 After four qualifying heats and a final race, a PrezCon champion will be crowned. This is also the first in-person qualified Organized Play tournament of the current season. So the winner of the event will likely make a move in the OP rankings. I sadly will not be able to make it to PrezCon this winter but enjoyed my past visit and highly recommend Chris' event and the con in general.